Looking at the Chinese World, the students investigate the techniques the Chinese use in performance. We look at Tai Chi, Chinese Fan Dancing and Peking Opera. 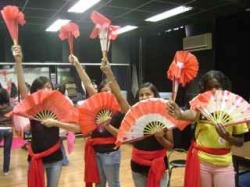 The student create a performance in either Tai Chi or Fan dancing. The students also design a Peking Opera costume and make up as part of their Knowledge and Understanding task. This page looks at Criterion A task.